Prepare Jell-O, using 2 cups boiling water and juice from canned pineapple and water or ice to make 2 cups. 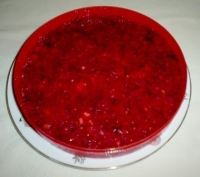 As Jell-O is congealing, mix the cranberry sauce with chopped pineapple slices, orange peel, chopped oranges and chopped nuts. 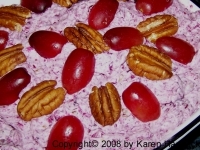 When Jell-O is consistency of raw egg whites, mix together with fruit and pour into a large mold or casserole dish. Refrigerate until firm. 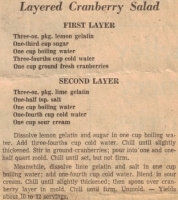 Great with turkey!